Truly creative content can be hard to generate - trust me, I get it. It's my job to be creative 24/7 and to be quite honest, it can be exhausting. To add to the "creative juices just aren't flowing today" obstacle I face sometimes daily (around 2 p.m. to be exact), I am presented with the challenging task of making a less-than-interesting topic (insurance, eek) seem interesting and buzz-worthy. Luckily, the beautiful thing I've learned through my career and the creative process is that any industry or product can, in fact, be transformed into a "fun" topic! I mean, how do you think funeral homes attract and retain business? They have to market services centered around death (the inevitable) and shine a positive light on the experience. Talk about tough! This is a prime example that anyone - you, me, a funeral home director - can keep our subjects light and positive. But as for making things original and interesting it does take plenty of coffee (or brain fuel as I call it), strategic thinking, and a touch of finesse...cue Bruno Mars. Let's start by diving into the one roadblock literally everyone faces when it comes to creating anything: What if the idea you're trying to write about has already been published by someone else? How can you possibly make it your own, and more importantly, do it better than the last guy? Basically, Mr. Twain is letting all of us creatives in the world know that it's okay if something you want to talk about or write about isn't yours because honestly, there are very very few unique ideas floating around out there - It's 2018 after all. If you've thought about it, don't you think someone else has too? The key is to make it your own, and in doing so, give credit when credit is due. So, how do you properly cite a source on the creative platform you're trying to navigate and stay far, far away from that awful "p" word? Consider these examples. This method ensures that readers know exactly who said what and where to find the original idea if needed. Plus, it helps when you mention the company of the professional you're quoting. This ensures that not only do they get full credit for their well-thought-out explanation, but their business will receive a little exposure too - which is always appreciated. Giving an easy route back to the origin of the statistic will allow your readers to learn more about that particular subject if needed. And leaving your readers with as little questions and confusion as possible will give them a better experience and more reason to want to read your content in the future. There are a couple of different routes you can take when giving credit to someone else's work on Twitter. You can retweet, or tag them in your post via the "@" symbol. 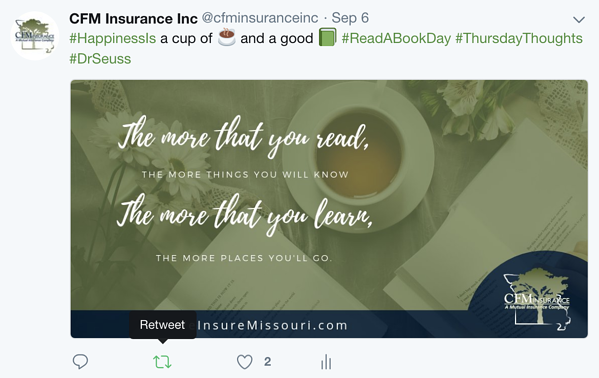 To retweet someone else's tweet, find those two little arrows in rotation at the bottom of a post you want to share and click away. If you plan on editing the original text of someone else's tweet, make sure and place "MT" in your content to show that it's a Modified Tweet. To mention someone when sharing their work on Twitter, type the "@" and pull up their Twitter username. When you do this, you credit them specifically for their work by leading followers back to the original content, while still making the post unique with your own wording. Facebook is pretty transparent when it comes to showing where content started, where it's been, and where it's going - making it nearly impossible for someone to "steal" another person's content. 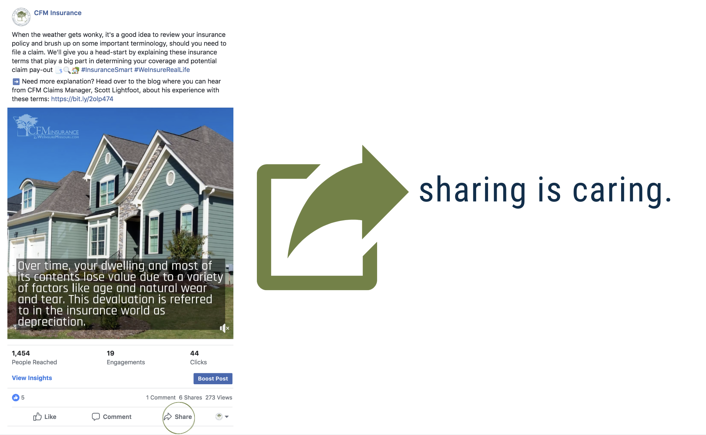 With the "share" button on Facebook, you can give proper credit to someone straight from their timeline. Or, similar to giving credit on Twitter, you can mention your source in a post with the "@" symbol letting followers know exactly where to find the original work you're posting about. When giving credit on LinkedIn, make sure to include a link to the content you're posting about in the update, and mention your source by name. Or, utilize that share button. As mentioned above, copycatting is far from illegal, but it is embarrassing and slightly offensive to the person who came up with the original work. While copycatting can come in many forms, it's most noticeable when comparing design schemes. You see, it's one thing to come up with similar ideas - people do that all the time - but it's another to copy someone's words and design that they took the time and brainpower to think of themselves. The good news is you can avoid this unappreciated practice by creating cool, 100% original work using one of the many easy-to-use design platforms on the web! These sites give users access to thousands of design templates that can be transformed into your own, one-of-a-kind creations. A couple of my favorites are Canva and Stencil. As I've stated from the beginning of this blog - there simply aren't a whole lot of ideas left out there that are truly original. But the cool thing about graphic design is you don't have to be a seasoned pro to make something really unique and interesting, thanks to the help of design platforms like the two listed above. While an idea may not be 100% yours to begin with, you can transform it into your own, starting with an appealing design made by none other than YOU! Think about it, why copy someone else's design when there are so many tools out there ready and willing to help you build and showcase your designs? In the end, it's a way better feeling to truly be able to say "Yep, I made that!" when showing off your work to your peers. Leaders create, followers copycat. 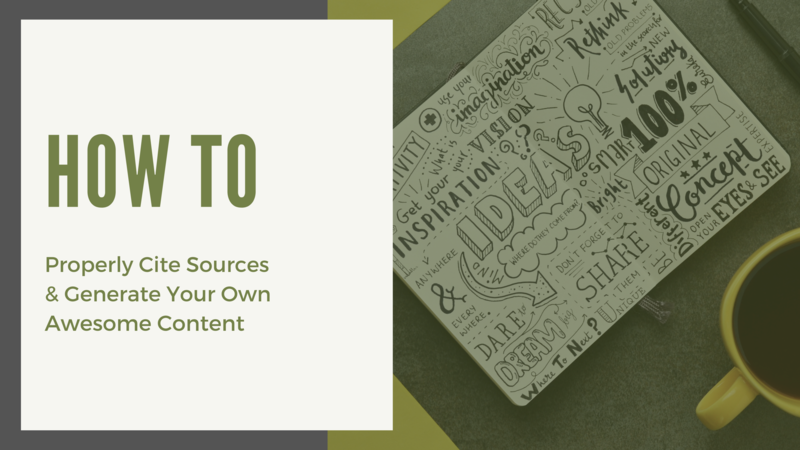 Let's get those creative juices flowing with some ideas on how to create your own content...from scratch! When I say research, I'm not talking about grabbing an encyclopedia from the library and breaking out the 'ol reading glasses (although there's absolutely nothing wrong with that if it's your style). Some of the most relevant research for literally any topic you're wanting to write about today can be found right here on the internet. Ideas can be generated from something as little as one word or picture. But you won't be inspired until you look at the work of others. Remember, it's okay to write about something that's already been talked about - the originality comes from you. Your creative personality can make any piece of content unique, but you'll have a hard time tapping into that originality if you don't let yourself be inspired by what others are doing and saying, first. To get inspired, I dedicate at least one day to research. Starting with a social media platform like Twitter, for example, I type in any keywords or hashtags that deal with the topic I'm writing about. That opens up all kinds of doors to different companies, bloggers, and everyday people who are talking about the subject I'm focused on, allowing me to see many reactions and responses to that particular topic. This helps gauge what kind of response I might get from my readers if I choose that topic. Then, I can begin to brainstorm and construct the personalized spin I will take in my work and form any unique ideas that others aren't utilizing. I find that it's not really about what you say, but more so how you say it. You can say what others are saying, but say it your way and say it a little bit better. And don't be hard on yourself if you need more than one day - great things take time! It's a marathon, not a sprint, and you don't want to come up with a finished product that's mediocre. So keep the clock out of the equation to really get the most out of your project. 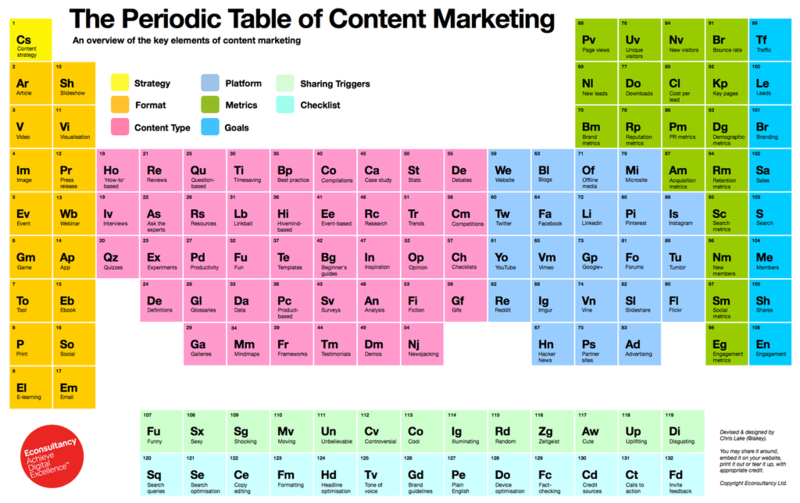 If you're stumped on what you want to talk about and how you're going to execute it, just use the Periodic Table of Content Marketing by Econsultancy's Chris Lake (@Lakey). This color-coded table will help you narrow in on specific content goals, piece your ideas together, and ultimately give you a more concrete direction when brainstorming. The 'Inverted Pyramid' structure has been a go-to tool in the world of journalism for years and because I'm a firm believer in "if it ain't broke, don't fix it," I follow it in every lengthy piece of work I write. You can't start a journey without a road-map and this is my road-map. So, why not make it yours, too? While the above image is an example for press release writing from the University of Leicester, you can make the pyramid work with any story you want to tell. Hook readers early on by diving right into your topic, then follow it up with some important details and hard-hitting quotes, whether it be from real people you've talked to or credited sources from around the web. Take readers home with a conclusion so they'll have no unanswered questions about the subject and let them meet you (the amazing creative genius behind the work) with a short, sweet bio at the end. Following the rules and breaking creative barriers - all at the same time - isn't so difficult. Meaning, give other awesome writers, bloggers, and designers in your industry credit for their phenomenal work correctly when you can. After all, you'd want them to do the same for you. But remember that it's okay to use their ideas to your benefit by branching off of them as needed to fit your brand's personality. Inspiration isn't hard to find, you just have to look for it.